SEOUL, May 17, 2016 (Yonhap News Agency) -- A rival candidate's withdrawal has opened the doors for South Korea to host the first-round games of the 2017 World Baseball Classic (WBC). The Central News Agency in Taiwan reported Monday that the Chinese Taipei Baseball Association (CTBA) pulled out of the race to stage the WBC games next year. The CTBA blamed its decision on Major League Baseball's delay in naming host venues. Taiwan submitted its application last November but has yet to hear from MLB. "The delay has affected the ability of the both the association and the would-be host city of Kaohsiung to prepare for a major international event such as the World Baseball Classic," the CNA report said. "According to the association, it made the decision after discussing the situation with Kaohsiung authorities and will formally inform Major League Baseball that it is withdrawing the bid." South Korea put in its bid in January, hoping for Gocheok Sky Dome, which opened last fall, to be the venue. The early round WBC games are held in March when the weather remains cool in parts of South Korea. 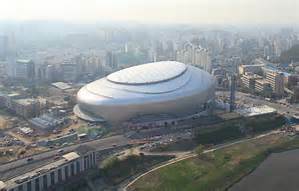 In April Richard Lin, secretary-general of the CTBA, said South Korea was favored over Taiwan because of the dome. South Korea hasn't hosted any WBC games since the tournament was launched in 2006. Taiwan hosted first-round action in 2013. Japan, which staged games in each of the first three WBCs, will likely return as a host in 2017, while South Korea and Taiwan were vying for one more slot in Asia. MLB is expected to announce host nations sometime in May. A KBO official said the South Korean organization hasn't heard from MLB yet, and it was still trying to determine the exact cause behind the CTBA's reported decision to withdraw its bid.